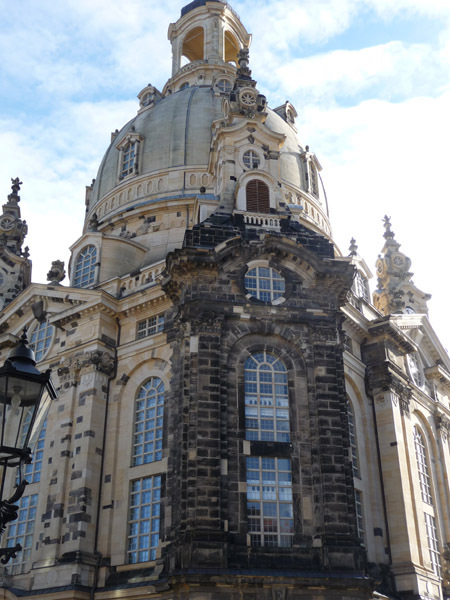 We stopped in Dresden for one day on our way to Prague and learned about the destruction and rebuilding of this lovely City. The Frauenkirche, a Lutheren Church in the middle of the Old Town, was destroyed during the Battle of Dresden in WWII, It was reconstructed by 2005, using the original plans and photographs. Many of the original stones were saved and incorporated in the construction. The old black stones in my photo are very obvious. 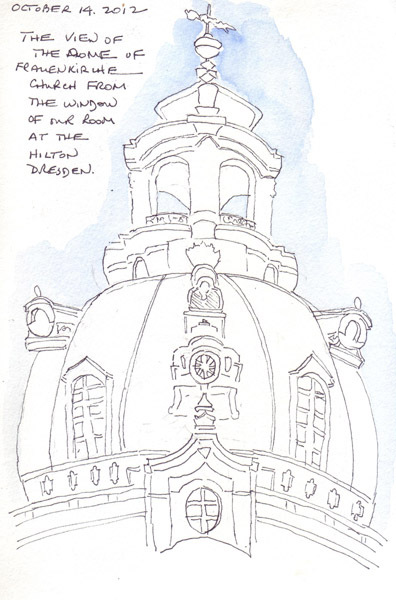 I was able to draw the church dome from our hotel room. We also visited the Albertinum (Art Museum), the Bundeswehr Museum of Military History with a Daniel Libeskind extension, and Neues Grunes Gewolbe Museum of Treasury Art (The Green Vaults). Each of these were wonderful museum collections. Berlin is a big bustling city and it is almost impossible to imagine that 75% of it was destroyed in WWII and is now rebuilt. We took a Hop On/Hop Off bus on our day of arrival, to stay awake after an overnight flight from the US. It was a wonderful way to see many of the sights that were further from the center of the City. The Soviet style architecture of East Berlin differs greatly from the resonstruction done in West Berlin. We took a 3 hour Third Reich walking tour on the second day (Original Berlin Walks). Our guide was a PhD candidate and not only did she discuss lots of important history with us, but she was very interested in discussing the shame of being a German. Her grandfather was a Nazi, in a small village in Germany, and spent a year in prison after the war. School children must learn the history of WWII 5 times in their school curriculum and there are required visits to the scenes of terror and death. 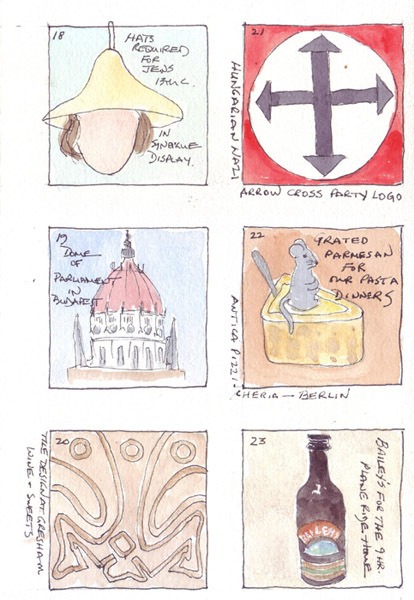 These are drawings done while walking with our guide. 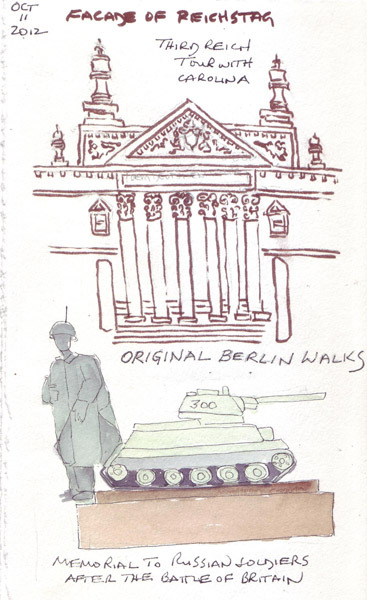 The detail of the facade of the Reichstag and the Soviet Memorial (to the soldiers who fought in the Battle of Berlin) were drawn while listening. 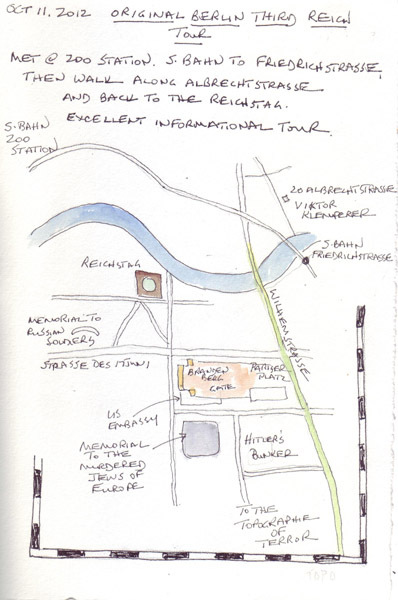 For each walking tour, I did a drawing of our itinerary in my sketchbook, so I would remember some details. 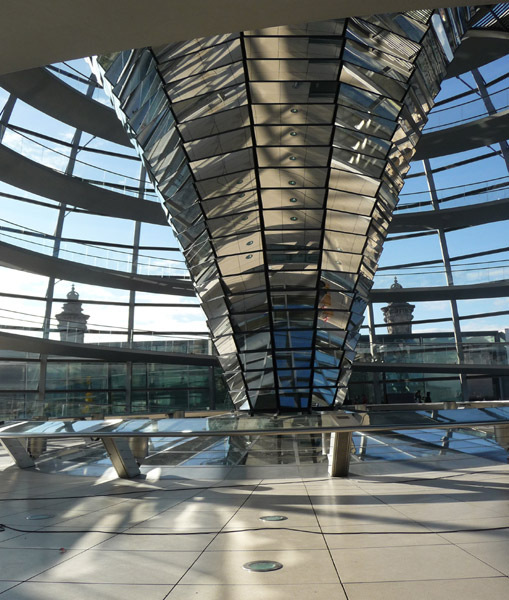 The Reichstag Dome was closed for annual cleaning and maintenance, but we were able to walk around it, see Berlin from the rooftop terraces, and then have a fabulous lunch at the restaurant overlooking Berlin. It is definitely worth making a reservation for lunch in the restaurant (Kafer Berlin GmbH) during a visit. Here is my photo of the Dome, by Sir Norman Foster, seen from the entrance on the roof. We just returned from our visit to Berlin, Dresden, Prague and Budapest. 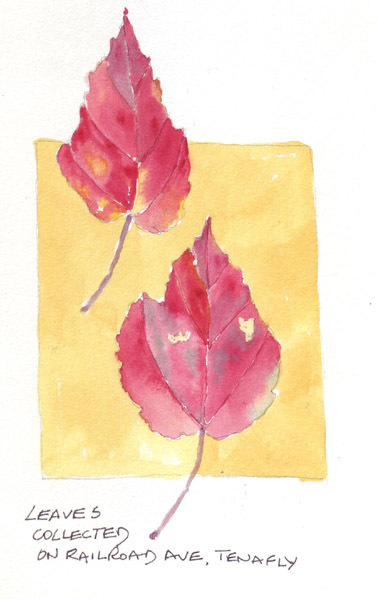 I sketched throughout our trip, but we were almost always on the move and most of my sketchbook pages were done while walking. 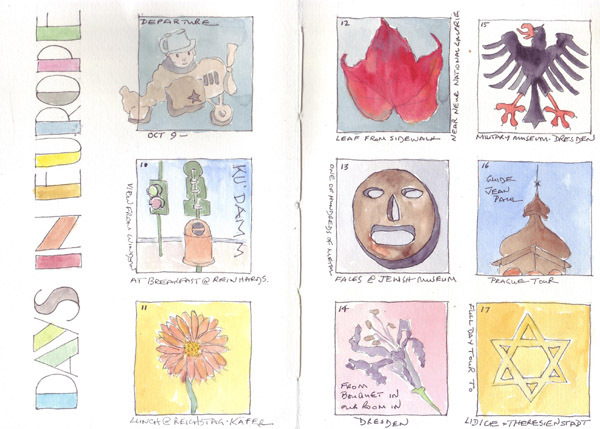 Each day I also selected one image to paint in the 2 X 2" grid I made before we left. Here is the completed grid. It was very important for me to visit these cities and to learn more of their history during WWII and the Soviet occupation that followed. We spent one full day in Prague visiting Lidice and Terezin, and this was one of the most memorable days of our trip. 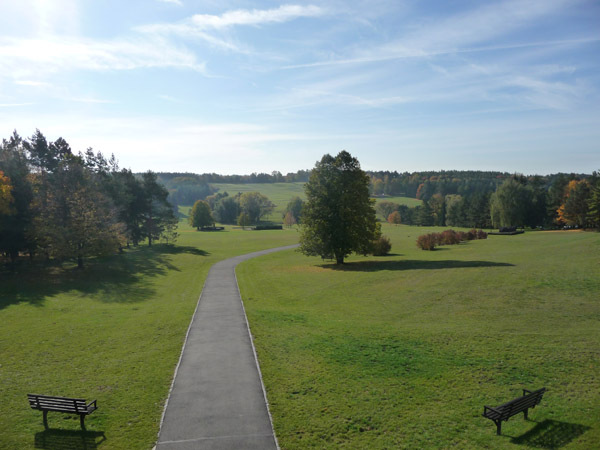 The Nazis totally destroyed the town of Lidice (shooting the men, gassing the children, and transporting the women to the camps) to revenge the assasination of Nazi Reinhard Heydrich. Here is a photo I took of the current site of the non-Jewish farming and mining Czech town. We toured the museum, and saw the memorials in Lidice. 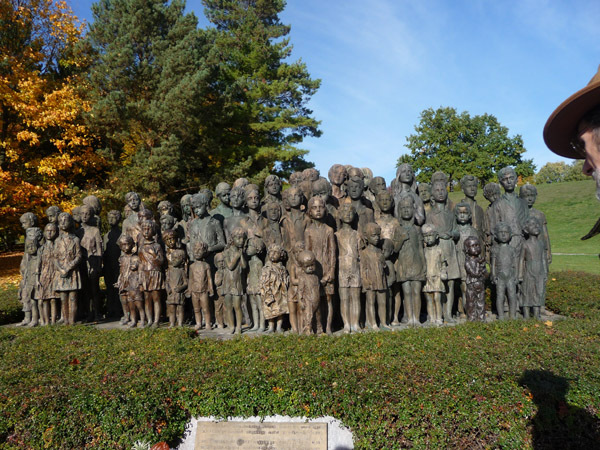 The statue, created by Maria Uchytilova (1969-89) memorialized the 82 children that were murdered. It is extraordinary! 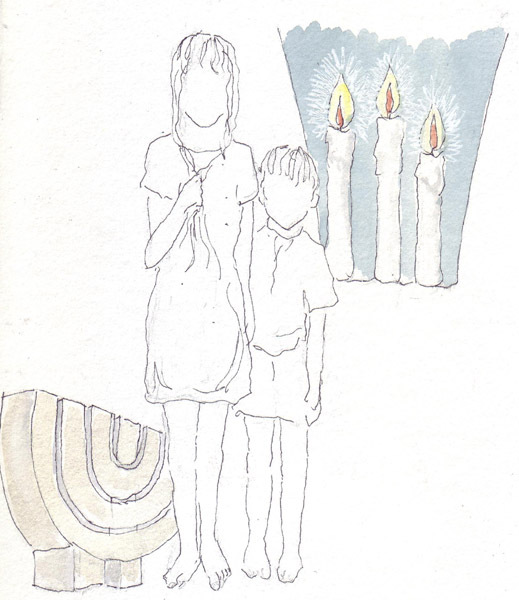 I sketched several children and then added candles that were painted on the wall in a hidden Terezin synagogue room (created by imprisoned Danish Jewish craftsmen) and one of the very large Terazin memorials (that is in a cemetary field where prisoners who died of typhus etc were buried). Terazin was the "model" Nazi camp - the one that the Red Cross visited to "falsely" assess the conditions in Nazi camps. However, it was a transfer station on the way to Auschwitz - and the majority of prisoners from Terazin were transported and murdered there. There were many artists held prisoner in Terezin (also called Theresienstadt) and the art museum contains secret drawings and paintings that were done, before they were murdered in Auschwitz. There is a large book containing all of these,that was published in 2002, entitled Art Against Death. It was too big and heavy to carry home, but I loved it so much that I will search for it in the US. 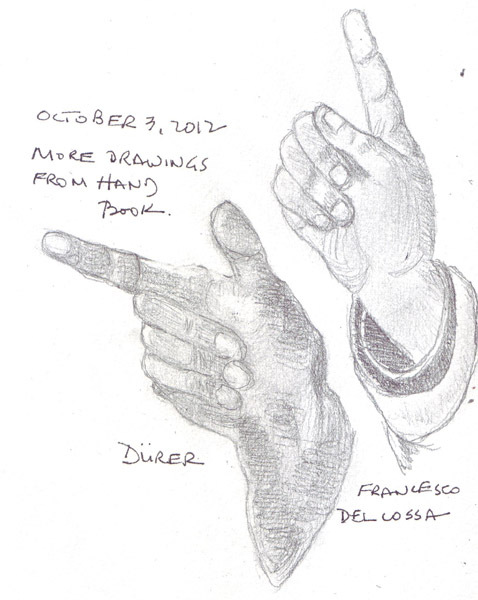 More hand drawing practice from my recently purchased used book that has glorious hand drawings by the Masters. I really hope that someday I will internalize these shapes and forms. 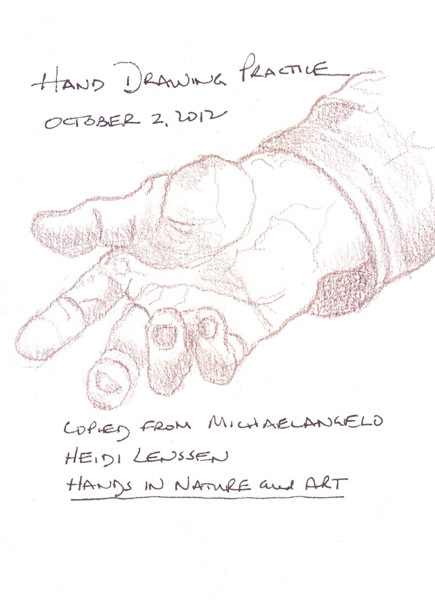 The first hand was drawn with a watercolor pencil, but then I decided not to wet it. The second page was drawn with a 2B graphite pencil. 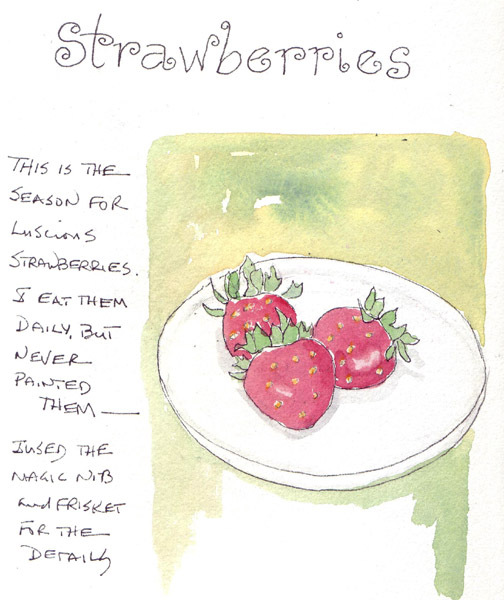 I used liquid Frisket to mask the spots on the strawberries and the leaves.